Phillip F. Tarver (Phil Tarver) is senior Pastor of United Faith Center Ministries International and gospel recording artist. Phil served under such great spiritual leaders as Bishop Claude E. Tears of the First Corinthians Baptist Church, Bishop Larry Trotter of the Sweet Holy Spirit Church, Pastor Elijah C. Smith Jr. of the Temple of Praise Outreach & Deliverance Ministries where he was ordained a minister of the gospel in 1991 and appointed Elder in 1993. Prior to Pastoring, Phil served under the leadership of Apostle H. Daniel Wilson of Valley Kingdom Ministries International. In 2001 Apostle Wilson confirmed Phil as Elder and in 2007 affirmed in the grace gift of Prophet. 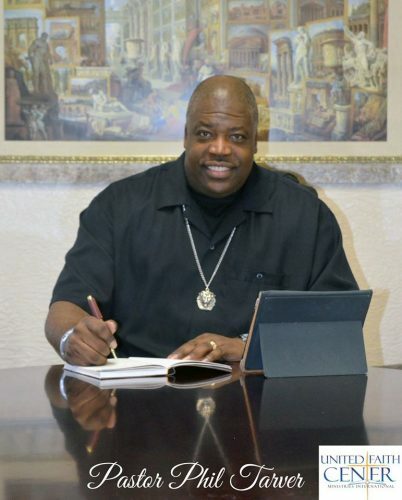 Phil served as Director of Music Ministry and worship leader of Valley Kingdom Ministries International's praise team, "Shekinah Glory Ministry". The release of new songs and prophetic proclamation is clearly heard throughout worship as a minister and worshipper, which open doors for Phil to record three solo projects: Be Pleased, Draw Nearer, and Place of Worship. The CD/DVD Draw Nearer is known for the chart topping song, "Better Than That”, “Sweet Spirit” and “Psalmist Prayer”. In obedience to the will of God, United Faith Center Ministries International was launched in December 2012. The vision of United Faith Center Ministries International is to build strong individuals and strong families that will model the love of God and reach the world with the good news of Jesus Christ according to Ephesians 4:11-16. Pastor Phil’s desire is to unite worship teams, congregations and leaders in ministry. Phillip and Vondrea are celebrating thirty one years of marriage and they have five young adult children,: Phil Jr, Phylicia, Isaac & Teresa, Tenetia, Alicia and two grandchildren.